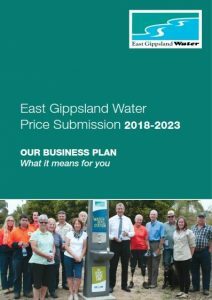 During June the Essential Services Commission gave notice under section 35(2) of the Essential Services Act 2001 (Vic) that it has made a determination in respect to the maximum prices East Gippsland Water may charge for the period 1 July 2018 – 30 June 2023. 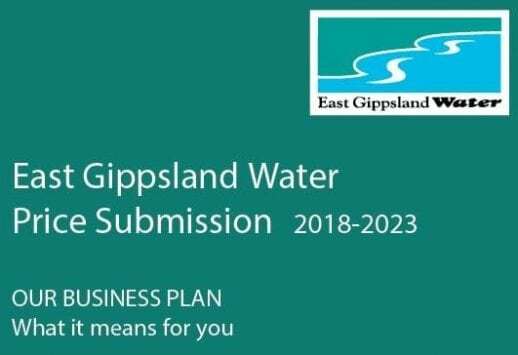 This means that East Gippsland Water’s 2018-2023 Business Plan has been accepted. For more information click here. Deliberation undertaken by Essential Services Commission taking into account information received through their public consultation process. A draft decision has been released by the ESC in relation to the Price Submission we submitted, which detailed our proposed prices, projects and the outcomes we are looking to achieve during the period 2018-2023. It also detailed the community engagement we have undertaken to help shape the submission. If you would like to review the draft decision or provide feedback please click here. 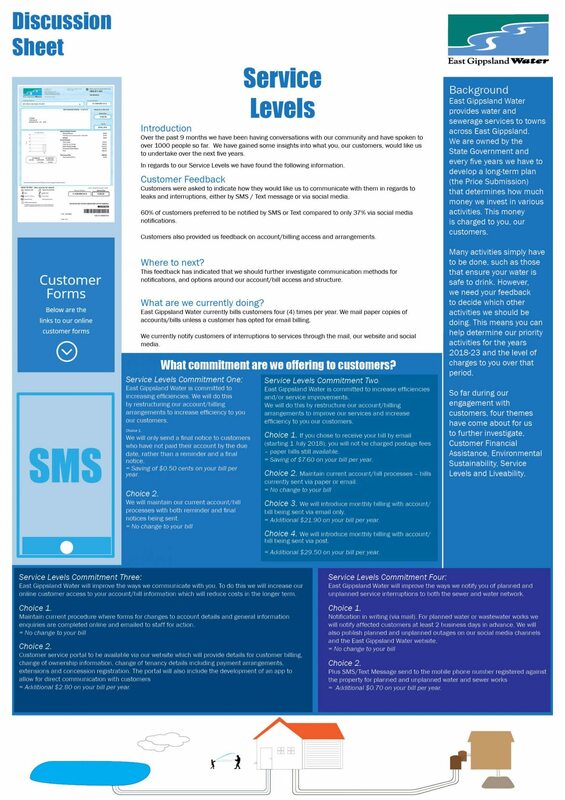 Feedback was available to be provided until 9 March 2018. The final draft is submitted, detailing our proposed prices, projects and the outcomes we are looking to achieve during the period 2018-2023. This will also detail the community engagement we have undertaken to help shape the submission. If you would like to view our submission or provide feedback please click here. 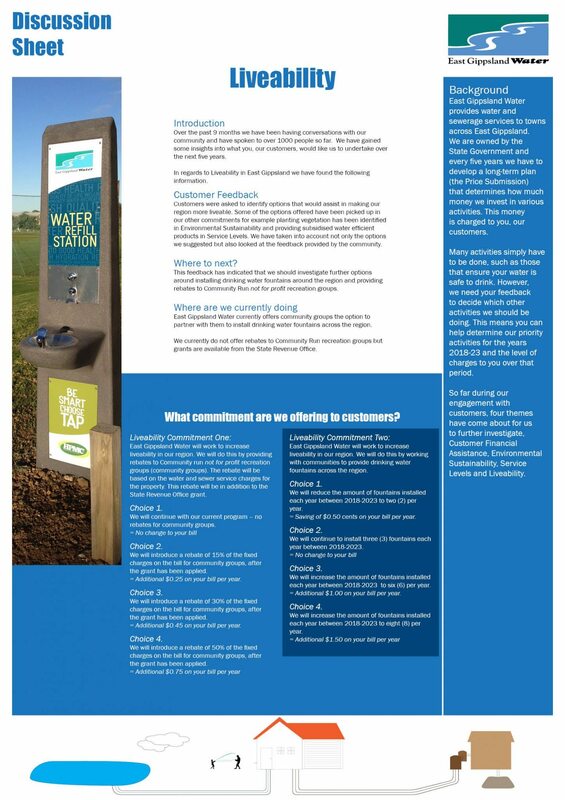 We will outline to the community our proposed prices for 2018-2023 as well as our targets in the areas of hardship, environmental sustainability, service levels and liveability based on the all the feedback we have received from you over the past 12 months. 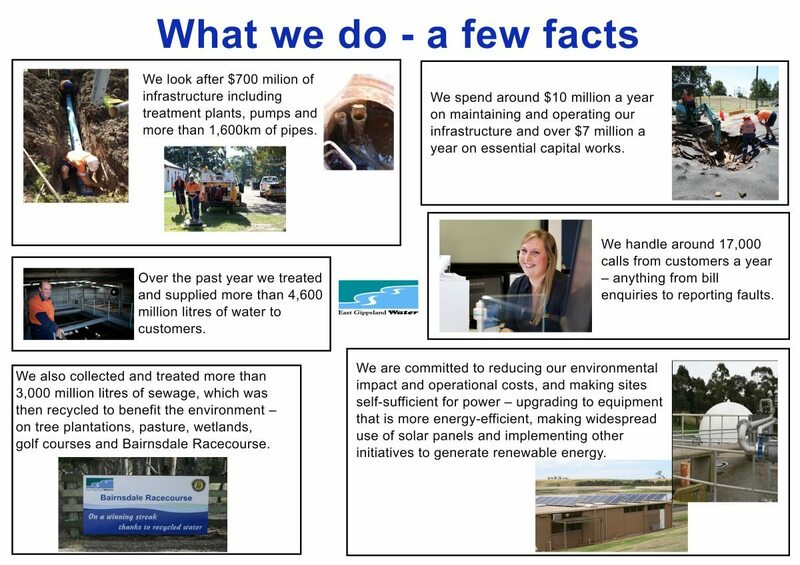 We will also provide information on our Capital Projects, our Operational Expenditure and our Guaranteed Service Levels. Please click on the image below to see our proposals. You can use this information to complete the comment card. For every comment submitted online or by comment card, either through the mail, one of the Water Cafes or at the Houses Sessions, we will plant a native shrub or tree as part of our ongoing commitment to the environment. Comments for this round of engagement have now closed. The results of the survey have been taken to the Customer Committee and they have provided their recommendations. These recommendations are now available to the community to provide submissions on prior to the options being included in the final draft document. The draft price submission is finalised taking in to consideration feedback received from the last round of community engagement. Based on what you’ve told us so far, we will be seeking your feedback on various service options and the potential costs involved. We are hosting Water Cafes, visiting Neighbourhood and Community Houses, and holding various conversations with you to help us shape the final draft plan. Over 400 surveys were completed during this survey. Click on the tabs for ‘Water Cafes’ and ‘Neighbourhood and Community Houses’ to find out where we will be and when. Results are analysed to prepare for the next round of engagement. We use an online survey to collect feedback from around 900 customers, which is accessible via our website and Facebook page. We also have a hard copy version from our head office in Bairndsale and at all local Neighborhood and Community Houses. In addition we host 12 Water Cafe’s at various community events around the region. 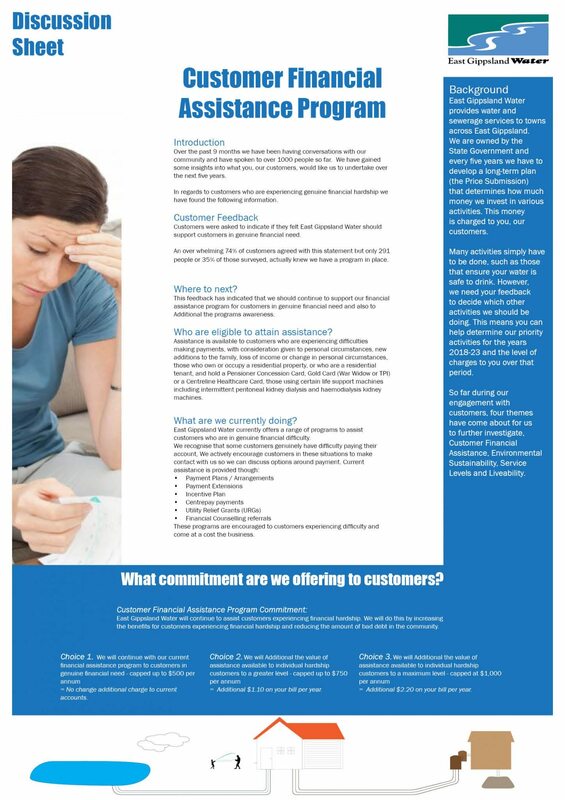 Feedback from Customer Conversations helps prioritise areas of our business for further detailed customer engagement. This is instrumental in helping to shape our online survey. Twenty-four conversations are held, with a total of 63 participants. Those taking part include Year 9-12 students (future bill payers), local aboriginal groups, small and major business customers, community groups and residential customers. The conversations or Peer Research, are hosted by a representative from InSync Surveys Pty Ltd or by a Customer Committee member. East Gippsland Water staff also attend to assist with technical questions. 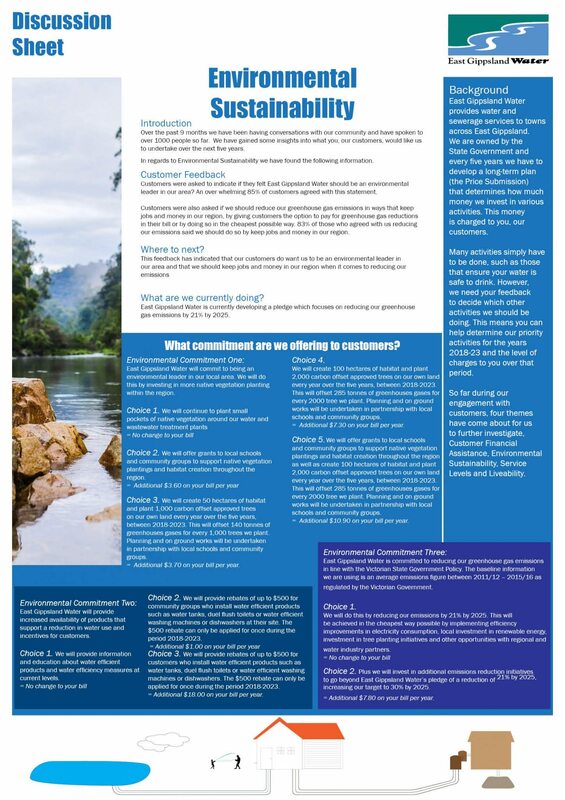 General question areas based around agreed themes are drafted by East Gippsland Water and the Customer Committee, working with InSync Surveys – to act as the basis for customer conversations. Initial consultation is undertaken with our Customer Committee and staff to identify the most important themes for further customer engagement. 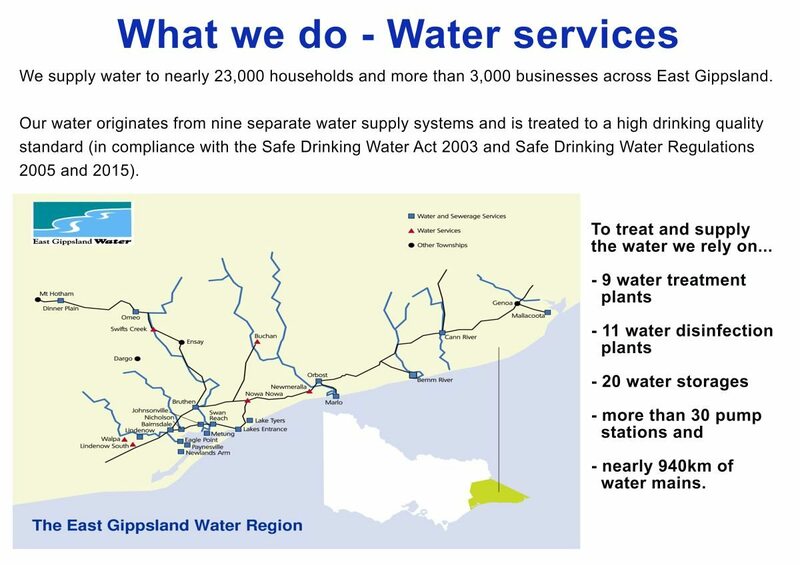 results from the Water Services Association Customer Perceptions Survey. Staff put forward suggestions for projects and business priorities during the period 2018-2023. Finally …. to get you thinking…. So why buy bottled water? 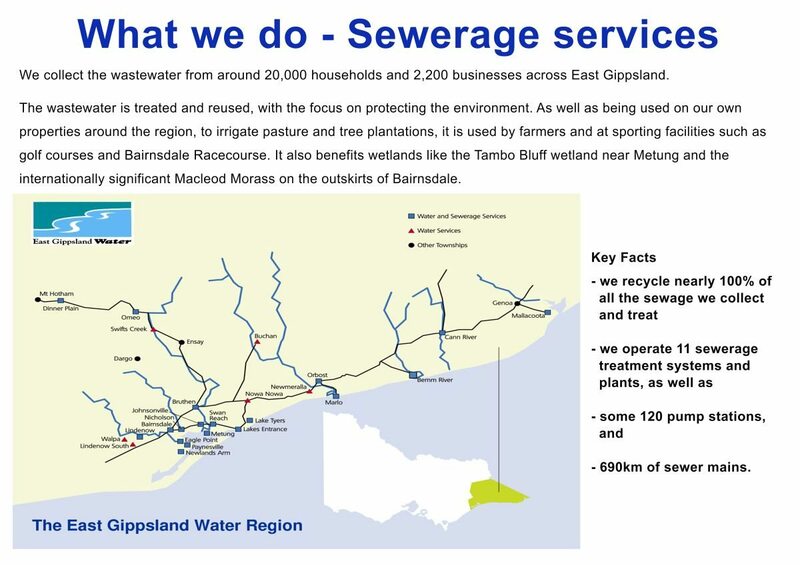 Video provided courtesy of Yarra Valley Water and the Choose Tap Coalition. What are the three P’s? Want to ask us a price submission question?